Production: Transcona Enterprises; Technicolor, 35mm, CinemaScope; running time: 154 minutes, originally 182 minutes. Released 1954 by Warner Bros. Re-released 1983 with original 47 minutes restored. director: Malcolm Bert; music: Harold Arlen and Ira Gershwin, and Leonard Gershe; costume designers: Jean Louis and Mary Ann Nyberg; choreography: Richard Barstow. 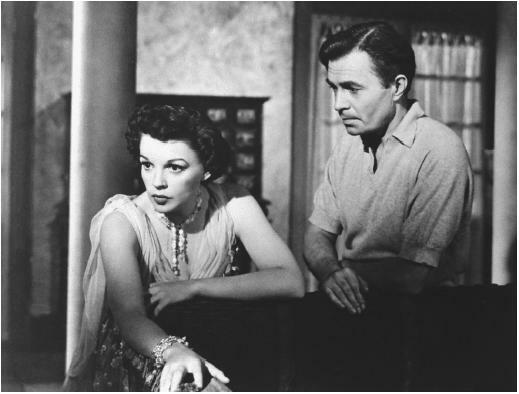 Cast: Judy Garland ( Esther Blodgett/Vicki Lester ); James Mason ( Norman Maine ); Jack Carson ( Matt Libby ); Charles Bickford ( Oliver Niles ); Tommy Noonan ( Danny McGuire ); Lucy Marlow ( Lola Lavery ); Amanda Blake ( Susan Ettinger ); Irving Bacon ( Graves ); Hazel Shermet ( Libby's secretary ); James Brown ( Glenn Williams ); Lotus Robb ( Miss Markham ); Joan Shawlee ( Announcer ); Dub Taylor ( Driver ); Louis Jean Heydt ( Director ); Bob Jellison ( Eddie ); Chick Chandler ( Man in car ); Leonard Penn ( Director ); Blythe Daly ( Miss Fusselow ); Mae Marsh ( Party guest ); Frank Ferguson ( Judge ); Nadene Ashdown ( Esther, age 6 ); Heidi Meadows ( Esther, age 3 ); Henry Kulky ( Cuddles ); Jack Harmon ( 1st dancer ); Don McCabe ( 2nd dancer ); Eric Wilton ( Valet ); Grady Sutton ( Carver ); Henry Russell ( Orchestra leader ); Robert Dumas ( Drummer ); Laurindo Almeida ( Guitarist ); Bobby Sailes ( Dancer ); Percy Helton ( Drunk ); Charles Watts ( Harrison ); Stuart Holmes ( Spectator ); Grandon Rhodes ( Producer ); Frank Puglia ( Bruno ); Wilton Graff ( Master of Ceremonies—last scene ). Domarchi, Jean, George Cukor , Paris, 1965. McVay, Douglas, The Musical Film , London, 1967. Morella, Joe, and Edward Epstein, Judy—The Films of Judy Garland , New York, 1969. Steiger, Brad, Judy Garland , New York, 1969. Carey, Gary, Cukor and Co.: The Films of George Cukor , New York, 1971. Lambert, Gavin, On Cukor , New York, 1972. Clarens, Carlos, George Cukor , London, 1976. Parish, James R., and Michael Pitts, Hollywood on Hollywood , Metuchen, New Jersey, 1978. Mason, James, Before I Forget: Autobiography and Drawings , London, 1981. Haver, Ronald, A Star Is Born: The Making of the 1954 Movie and its 1983 Restoration , New York, 1988; 1990. Morley, Sheridan, James Mason: Odd Man Out , New York, 1989. McGilligan, Patrick, George Cukor: A Double Life—A Biography of the Gentleman Director , New York, 1992. Shipman, David, Judy Garland: The Secret Life of an American Legend , New York, 1993. Clarke, Gerald, Get Happy: The Life of Judy Garland , New York, 2000. Brinson, Peter, in Films and Filming (London), December 1954. Bitsch, Charles, "Naissance du cinémascope," in Cahiers du Cinéma (Paris), June 1955. Reid, John Howard, "George Cukor," in Films in Filming (London), August and September 1960. Jomy, Alain, "Connaissance de George Cukor," in Cinéma (Paris), June 1963. "Retrospective Cukor," in Cahiers du Cinéma (Paris), February 1964. Overstreet, Richard, "Interview with George Cukor," in Film Culture (New York), no. 34, 1964. Nogeuira, Rui, "James Mason Talks About His Career in the Cinema," in Focus on Film (London), March-April 1970. Beylie, Claude, in Ecran (Paris), January 1974. Legrand, M., in Positif (Paris), February 1974. Sarris, Andrew, "Cukor," in Film Comment (New York), March-April 1978. Jennings, W., "Nova: Garland in A Star Is Born, " in Quarterly Review of Film Studies (Pleasantville, New York), no. 3, 1979. Mitchell, Robert, in Magill's Survey of Cinema 4 , Englewood Cliffs, New Jersey, 1980. Phillips, Gene D., "George Cukor: Fifty Years of Filmmaking," in Films and Filming (London), January 1982. Villien, Bruno, and others, "George Cukor," in Cinématographe (Paris), February 1982. "Cukor Section" of Casablanca (Madrid), March 1983. Magny, Joel, "George Cukor: Un Homme qui s'affiche," in Cinéma (Paris), March 1983. New York Times , 15 April 1983. Haver, R., "A Star Is Born Again," in American Film (Washington, D.C.), July-August 1983. Simons, J., in Skrien (Amsterdam), Winter 1983–84. Roddick, Nick, in Monthly Film Bulletin (London), January 1984. "A Star Is Born Issue" of American Cinematographer (Los Angeles), February 1984. Calum, P., in Kosmorama (Copenhagen), August 1984. Magny, Joel, in Cinéma (Paris), September 1984. Rabourdin, D., "Deux rencontres avec James Mason," in Cinéma (Paris), September 1984. Cieutat, M., "James Mason, Bigger Than Stars," in Positif (Paris), November 1984. Arts, A., in Skrien (Amsterdam), November-December 1984. Eyquem, O., in Positif (Paris), April 1985. Doyle, N., "Letters," in Films in Review (New York), vol. 40, October 1989. Stanbrook, A., "As It Was in the Beginning," in Sight and Sound (London), no. 1, 1989–90. Lassell, M., "Mirror of the Mind," in Movieline (Escondido, California), March 1990. Berthomé, Jean-Pierre, "L'oeuvre insaisissable," in Positif (Paris), no. 424, June 1996. The "birth of a star" has proved to be a durable cinematic conceit. The story of the fading, alcoholic male actor who discovers a talented young woman, fosters her career, marries her, and finally commits suicide was first made in 1937, directed by William Wellman, with Janet Gaynor and Fredric March. The 1954 George Cukor version represents the basic outline of the original scenario while transforming the woman into a singer. And in 1976, the situation served rock stardom as well, with Barbara Streisand and Kris Kristofferson. The germ for this theme and its variations is the 1932 What Price Hollywood? , also directed by George Cukor, starring Constance Bennett, Lowell Sherman and Neil Hamilton. There, the male figure is divided in two—a drunken director and a society husband—and the film reunites husband and wife in a happy ending. But it is the 1954 Star that is most often revived and best remembered. Hollywood has made many reflexive films in which it examines its own procedures, manners, and mythology. The trenchant reflexivity of Sunset Boulevard , The Bad and the Beautiful and A Star Is Born (products of those difficult Hollywood years, 1950–54) is in the intimate exposure of the performer's craft, a particularly painful exposure when we learn that craft and life are so intimately connected. It is impossible to separate Gloria Swanson and Lana Turner from the fictions they incarnate. The connections are most troubling in the case of Judy Garland, the star who is presumably born, but who, in fact, is nearly at the end of her musical career. The only other film in which her singing is prominently featured is her last effort, made in England, I Could Go on Singing , with its sickeningly ironic title. A Star Is Born was meant to be the vehicle that re-established her as a viable movie star, after her humiliating dismissal from MGM in 1950. The public was aware of her personal problems, her fluctuating weight, and her suicide attempt. Now, with our knowledge of Judy Garland's difficulties in Hollywood, of her missed concert dates, her failed TV program and her tragic, drug-related death, it is impossible not to see the film's ultimate reflexivity in the way the figure of the unreliable star, the husband, is a surrogate for Garland herself. Each time Vicki Lester "bails out" Norman Maine and "understands" his problems, it is Garland looking at Garland, not James Mason— Garland exposing her own fears and weaknesses through the male character. Made at great expense, over a long shooting schedule, the production of A Star Is Born was fraught with difficulties that seemed to echo those of Garland. After director George Cukor finished his work, it was decided the film wasn't musical enough. Cuts were made (and deplored by Cukor) to permit the inclusion of a long sequence, "Born in a Trunk," a musical biography of a performer reminiscent of the "Broadway Melody" number in Singin' in the Rain . Still nervous about the film's length, the studio, several days after its release (to excellent reviews), cut it from 182 minutes to 154 minutes, hoping it would fit into a more conventional exhibition program. The film was further cut to 135 minutes. The film's appeal survived its radical surgery. And that appeal is not limited to Garland. Rather, she is not put in relief by the elegant mise-en-scène that exploits with great care the compositional elements mandated by the CinemaScope format, by the lighting and set direction that keep in balance both the film's intimacy and its grand proportions, by the Harold Arlen score that provided Garland and all subsequent torch singers with the classic "The Man That Got Away," and by the performance of James Mason, supportive yet stellar in its own right. A Star Is Born is, in fact, a celebration of a dual register of performance—as a function of artifice, technique, audience and as the revelation of personal intimacy captured by the movie camera. The stage that opens and closes the film is the gigantic Shrine Auditorium. It first exposes Norman Maine's drunken disruption of a charity show. In the final shot, it is the frame for Vicki Lester's return to her public, performing self, when she receives an ovation for presenting herself as "Mrs. Norman Maine." The performer's identity shifts through a series of qualifying frames. Norman falls in love with Vicki (still called Esther Blodgett) when he hears her sing "The Man That Got Away" with and for a small group of musicians. The song is sustained in a camera movement that accommodates her own position as well as her connection to the instrumentalists, the privileged witnesses/collaborators. Norman's witnessing is, like our own, full of wonder at the talent generated by personality and technique. Norman exhibits his talent at the end of the film, when he "acts" happy and cured just before going out to drown himself. Vicki's progress to stardom is the occasion for satirical views of the movie industry, episodes familiar from other films but done here with exceptional care and wit. The starlet is literally given the runaround during her first day at the studio, as unceremoniously pushed through a series of departments and doors, only to exit where she entered. No one has really taken the time to find out who she is. That process of Hollywood de-identification is made graphic when the makeup artists examine Vicki's face, declare it is all wrong, and transform her into a caricatural idea of beauty. During her first screen appearance, the director wants only to see her arm, waving a handkerchief from a departing train. When she finally does become a star she performs her big production number all by herself in her living room, turning the furniture into the "sets" for exotic locales. The varied scope of the star's identity is most emphatically emblemized in the scene where Vicki Lester receives an Academy Award. Norman drunkenly interrupts the ceremony and accidentaly slaps his wife. This private gesture is exposed before three audiences— the spectators within the fiction, those implied by the presence of the gigantic television screen within the shot, and ourselves. Yet another painful irony of this painful moment is the fact that Judy Garland, expected to win an Oscar for her performance in A Star Is Born , lost to Grace Kelly.